Home / Tea Info / Can Tea Help You Live Longer? Can Tea Help You Live Longer? While just one cup a day may not keep the doctor away, research shows that drinking tea, be it green, black, white or oolong, can be good for one’s health. Drinking tea has long been an integral part of Japanese and Chinese cultures and it appears others would do well to follow their example. Various medical studies point to a beneficial impact of tea drinking on a decreased risk of cardiovascular disease as well as cancer. Surprisingly, researchers have even linked tea consumption to decreased risk of Parkinson’s and diabetes. These clinical trials suggest that tea is not just an enjoyable delectable drink, but may well afford a longer, healthier life. Research: A report in the highly reputable Journal of the American Medical Association found that tea drinking lowered heart-disease related mortality rate while the leading Journal of Cancer Research and Clinical Oncology published findings that drinking large amounts of green tea significantly reduced the occurrence of various cancers. Other research demonstrated that tea may help lower cholesterol, protect blood vessels, and can also aid in weight loss. What’s in tea? The source of this fountain of benefits is believed to be polyphenols and phytochemicals — biologically active natural compounds that are abundant in tea. Researchers specifically point to potent antioxidants, flavonoids and catechins as supplying much of the value. The often mentioned compound, Epigallocatechin gallate or EGCG, is a type of catechin and the most abundant catechin in tea. Although these potent components are present in other plants they are found in particularly large amounts in “real tea” (green, black, white, or oolong) — tea that is derived from Camellia sinensis, but not in herbal teas. Takeaway: Tea is the second most consumed drink in the world, next to water! And that is indeed good news, because given recent data there is reason to believe that sipping a few cups a day may lead to a healthier, longer life. Keeping the bushes well-pruned to waist level encourages young shoots to emerge, enhances quality and also makes the fresh flushing buds and leaves easier to pluck off by field workers, who are mostly women. A tea bush will grow a new flush every seven to fifteen days during the growing season. Harvesting tealeaves usually happens three to four times during the growing season. The way the leaves are processed determines the various type of tea, giving each its unique characteristics. 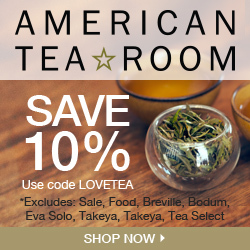 A great assortment of some excellent teas can be found here.